Think burger and you’ll think beef, but what about an alternative burger? 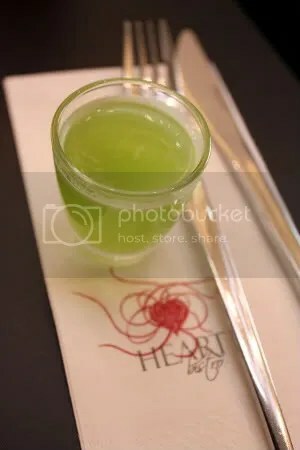 Heart Bistro whips up fantastic ones in my opinion. Shots of juice to get the tastebuds going. A curious concoction of mint, cucumber and celery which took a few seconds to get used to. 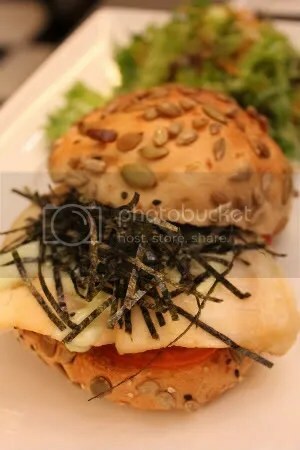 A japanese inspired burger- a generous slab of fish, wasabi mayo, seaweed shreds and veg. 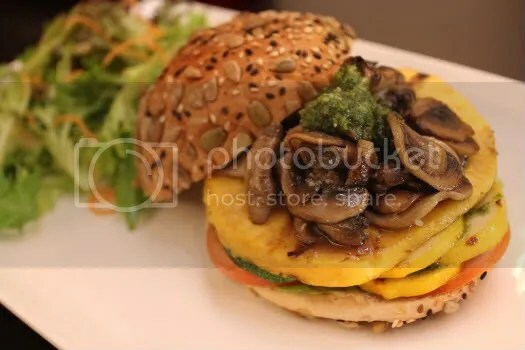 This has got to be the best and most flavourful mushroom burger in the world! Sauteed mushrooms resting on a neat stack of grilled fleshy vegetables ( butternut squash(! ), yellow zuchinni, tomatos and cucumber. A generous amount of pesto to perfume the whole ensemble. Finger-licking good, all the juices from the veg and the pesto kept dripping all over! 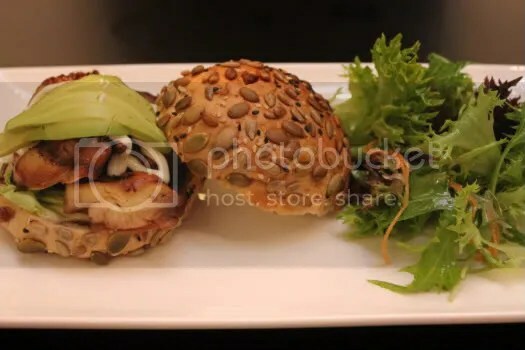 Kudos to the delicious burger bun studded with all sorts of seeds imparting an extra nutty flavour. There is really nothing to fault this mushroom burger in my opinion. Mom’s grilled chicken avocado was delicious too. Stole some of her chicken and it was really tender. And for all those who still can’t get enough of the quintessential beef burger, you’ll be glad to know they also offer a 100% beef burger here.